One of the biggest bits of news out of CES on Monday was the official unveiling of the Sony Xperia Z, a device that's been rumored for quite some time. 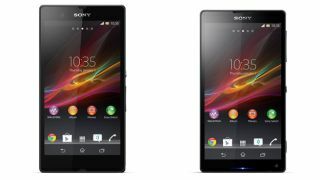 But alongside it Sony revealed another device: the Xperia ZL. Sony Xperia Z release date: when and where can you get it? If you'd like to understand the differences, you're going to have to look through a magnifying glass. Both Sony flagship phones sport a 5-inch 1080p display, a 13 megapixel camera, a 1.5GHz quad-core Snapdragon S4 processor, and 2GB of memory. But there is one key difference. The difference is in the size of the actual phone, despite the two devices having identical 5-inch 1080p displays. The Xperia ZL is actually .08 inches thicker than the Xperia Z, but its overall footprint is ever-so-slightly smaller, at 5.19 by 2.75 inches to the Xperia Z's 5.47 by 2.8 inches. What's the point of differentiating these two versions of the Xperia Z? No idea. As Gizmodo points out, there are a few other differences; the Xperia ZL is curved, and it has a physical camera button, an infrared emitter for using it as a remote, and a larger battery. It's unclear at this point exactly where the Xperia ZL will be released, since Sony's press release on Monday mentioned only "select regions." TechRadar has reached out to the company, but we've yet to receive a response.